Welcome to 2017 and the first episode of The Good, the Bad and the Ugly. For those on your first show, welcome! For those returning, thanks for coming back. We are looking forward to another year of amazing, deep, funky and sometimes just plain weird French and European 60s and 70s cuts, brought to you by the Babypop crew. Quickly, to reflect on the premise of the show. Babypop, a French 60s DJ crew want to play stuff we wouldn’t normally drop on the dance floor but we still LOVE. Cue the decks, cue the vinyl and cue the breaks and beats. Talking of rocks hard, it is time for some French Deep Purple and the hard rock stylings of Variations. We played the other side of this slab a few shows back, but we liked it so much we had to play the A-Side. The Spanish Beatles. Apparently. This lovely Beatle-esque track comes from 1966, when the Beatles themselves had move onto something different. Still pretty cool though. Released on Belter in 1967, this 1967 piece of girl pop is pretty cool. It is from an original, slightly scratched EP. I went on the hunt in Spain for some odd, rare Belter stuff and found this in a record store in San Sebastian. It took my fancy. One of the ‘minor’ Swinging Madamoiselles, this track comes from a 1968 EP. You can find her real Swinging stuff on compiles like Ultra Chicks and Tres Chic (on the RPM label). Normally known the absolute belter (La La La La) which is also on this EP, we present for you the actual A-Side of this 1964 EP. Originally written by Paul Anka this lovely little early 1960s piece is so cool. La La La La is a great night filler, gets people grooving and grinding to something that sounds more soul than it should. Released in 1968, this moody B-Side is often ignored. The singing style is reminiscent of Polnareff and runs counters to the more French style tracks on the EP. 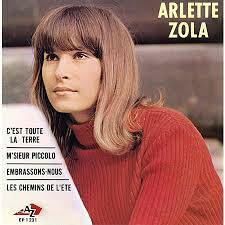 Recently comped as part of the 69 Année Mélodique LP which features lost b-sides of the sixties and seventies. Worth digging out that. LB is one of DJ Kuracs fave Italian singers named Lucio. Really, he loves the dude. The Italian Polnareff apparently. This is a great song from 1972 LP Il Mio Canto Libero is a great early seventies pop song, beautifully recorded. Loving it. Featuring Jimmy Page, yes Jimmy PAGE, this lovely little rocking ditty takes us out for this show. From 1963, this is Eddy Mitchell at his best. Swinging, crooning and rocking. This entry was posted in podcast and tagged beat, chanson, Europe, francais, french, italian, polish, pop, rock, seventies, sixties. Bookmark the permalink.